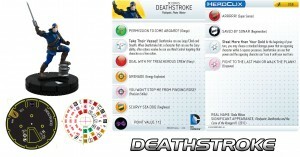 WizKids gives us a look inside the upcoming Flash set for HeroClix with a look at Dethstroke. Maybe he can tell us why all the rum is gone. Thanks for joining us we continue to explore the upcoming DC HeroClix: The Flash set! Today we check out a villain and sometimes anti-hero who became a pirate in search of his daughter in the Flashpoint universe, Deathstroke!